Boxing (pugilism, prize fighting, the sweet science or in Greek pygmachia) is a combat sport in which two people engage in a contest of strength, speed, reflexes, endurance, and will by throwing punches with gloved hands against each other. Amateur boxing is an Olympic and Commonwealth sport and is a common fixture in most of the major international games—it also has its own World Championships. Boxing is supervised by a referee over a series of one- to three-minute intervals called rounds. The result is decided when an opponent is deemed incapable to continue by a referee, is disqualified for breaking a rule, resigns by throwing in a towel, or is pronounced the winner or loser based on the judges’ scorecards at the end of the contest. 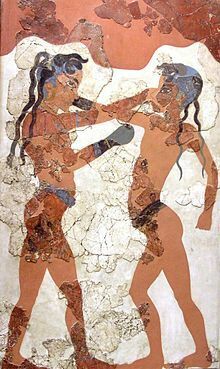 The origin of boxing may be its acceptance by the ancient Greeks as an Olympic game in BCE 688. Boxing evolved from 16th- and 18th-century prizefights, largely in Great Britain, to the forerunner of modern boxing in the mid-19th century, again initially in Great Britain and later in the United States.